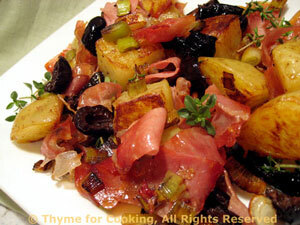 Potatoes, Prosciutto, Olives, Green Garlic, Thyme For Cooking gourmet sides. This is a recipe I came up with for a blog contest in the spring, right at the end of green garlic season. It has a lot of flavors and should pair well with simple roast or grilled meats and fish. Cut potatoes into large chunks and cook in boiling water until barely tender when pierced with a sharp knife, about 10 minutes. Drain. Pit black olives if necessary; cut black and green olives in half. Trim green garlic and slice, using as much of the green top as possible or trim and slice green onion and mince garlic. Snip thyme into small pieces if using. Heat oil in a medium nonstick skillet. Add potatoes and sauté until starting to brown on one side. Add Prosciutto and green garlic. Sauté until potatoes are nicely browned, Prosciutto is crisp and green garlic tender, about 10 minutes. Add olives and half the thyme, and sauté a few minutes longer. Serve, garnished with the remaining thyme.